Augustus. 27 BC-14 AD. 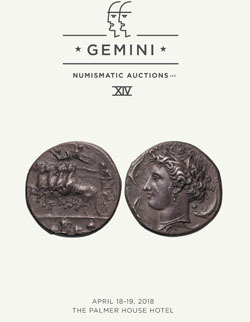 Denarius, 3.64gg. (10h). Lugdunum, 2 BC-4 AD. 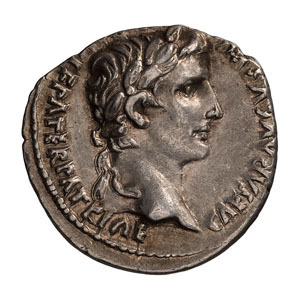 Obv: CAESAR AVGVSTVS - DIVI F PATER PATRIAE Head laureate right. 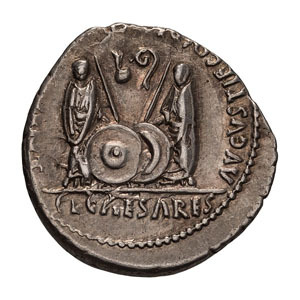 Rx: C L CAESARES in exergue, AVGVSTI F COS DESIG PRINC IVVENT around, Gaius and Lucius Caesars standing holding honorary shields and spears, simpulum and lituus above. BM 519. Paris 1651. Cohen 43. RIC 207. Unusually beautiful portrait of Augustus for this issue. Lustrous EF. Ex Berk 153, 13 March 2007, lot 259.